These weeks I have been working with Metro Ethernet technologies like E-Line VPWS and E-LAN VPLS to make Layer 2 VPN point to point or multipoint to multipoint. A multipoint to multipoint service can be made with VPLS tecnology that it allows us to simulate a big virtual private switch between our sites which is useful if we want to have layer two connectivity between datacenters. For instance, we could move virtual machines between datacenters easily if we have an hypervisor in each data-center, although they are in different cities. However, I want to talk about Traffic Engineering over MPLS this time. At the beginning, MPLS was used by service providers because it was too fast to switch labels instead of routing IPs but with the last technological advances in hardware acceleration for routing in the data plane like CEF (Cisco Express Forwarding) their time or delays are the same. Nevertheless, MPLS can be an interesting technology for Traffic Engineering if we combine it with RSVP and a dynamic routing protocol with traffic engineering extensions like OSPF and IS-IS. What can we do with traffic engineering? Mainly, we will be able to have more resiliency and resource reservation. 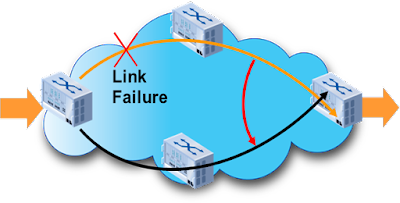 For instance, we could reserve bandwidth in some links, force a specific path, avoid some routers or hops, or choose a path with a specific delay and jitter to comply with SLAs and QoS. In addition, we can configure MPLS-TE in our network to use links more efficiently because it allows us to use several links at the same time. With this kind of technique we will have a more reliable network to meet with the requirements and SLA of our customers.